The Meeple Monthly goes into the minds of game designers, game publishers and game developers. Every month, we have brand new articles from professionals throughout the gaming industry, the latest in new releases and the last minute news about what will hit stores soon. Below you will find the new product listing portion of the latest issue of the Meeple Monthly. To see a full version of the Meeple Monthly, sign up for a subscription below or visit your FLGS today! 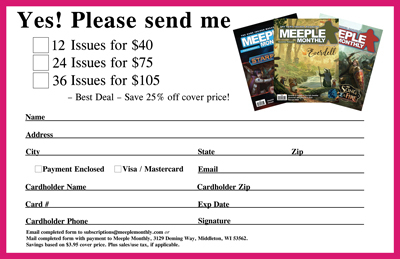 Email completed subscription forms to subscriptions@meeplemonthly.com. Manufacturers, for inquiries about advertising and articles email advertising@meeplemonthly.com.